Can people love the one they are compatible with? Leonard Lee, George Loewenstein, James Hong, Jim Young and I recently conducted a study on the ways that one’s own attractiveness influences their perception of, and actions toward, others. The first question we had is whether people who are less attractive themselves view the attractiveness of others differently. Using data sets from HOTorNOT.com we found that regardless of how attractive people themselves are, they seem to judge others’ attractiveness in similar ways, supporting the notion that we have largely universal, culturally independent standards of beauty (e.g. symmetric faces). 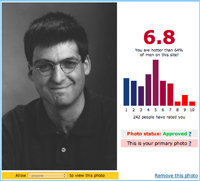 Moreover, we found that people prefer to date others who are moderately more attractive than they are themselves. We also found a difference in who they approached for a date, where less attractive individuals approached others who were less attractive. So in essence, less attractive people have the same sense of esthetics but being aware of their own attractiveness, they approach people who are in the same range as themselves. Finally, we wondered how less attractive individuals rationalized to themselves, their selection of less attractive others. Using a speed-dating study we found that more attractive people placed more weight on physical attractiveness in selecting their dates, while less attractive people placed more weight on other qualities (e.g. sense of humor). Much like the famous line from Crosby, Stills, Nash, and Young, people find a way to love the ones they can be with.